"[W]hen the site did not complete closure by the September 2016 deadline, it was referred to our Office of Compliance and Inspection for Enforcement Action. That Office has issued the attached action regarding the site." "If respondent promptly and satisfactorily complies with the requirements of this NIE, then DEM may decide to forego the assessment of administrative monetary penalties. Continued non-compliance, however, will result in the issuance of a Notice of Violation and Order, which will include the assessment of an administrative penalty, which may be as high as $25,000 per violation for each and every day that violation continues to exist." Read the full Notice of Intent to Enforce here. 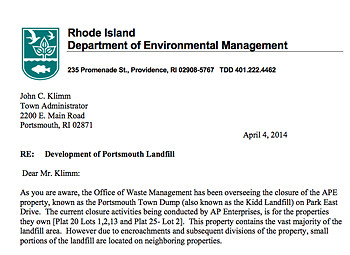 The Portsmouth landfill capping project is now officially closed to any soil not meeting residential standards, according to a letter sent from RI DEM to Arthur Palmer Enterprise (APE) and released to the media this afternoon. According to the terms set forth by DEM in their original approval of the project, the only work allowed on the site now is the grading and shaping of the final cap which must be completed within the next year. The following letter was sent on Monday to APE as confirmation that the Beneficial Use Determination, allowing the site to accept alternate soils meeting industrial/commercial standards has expired. As per the original approval, the remaining cover soils at the site will need to meet residential standards. Site closure is required within 1 year. You can download the DEM letter here. As you are aware, the Department issued a Notice of Intent to Enforce regarding a soil received from Newport that was found to be unacceptable. Since then, soil has been removed, confirmation sampling has been done and APE has agreed to do more frequent sampling. Consequently, a Letter of Compliance was issued today (attached). 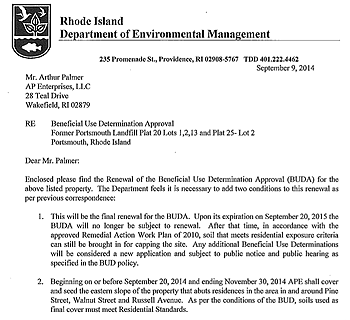 As you may be aware, the Beneficial Use Determination will end on September 20, 2015. After this date, AP Enterprises will only be allowed to accept soil meeting residential criteria and will have to complete final capping, grading and seeding activities within 1 year. In the enclosed "Letter of Compliance," Dennen outlines the remediation steps that Arthur Palmer Enterprise (APE) had taken: removing the soil, disposing of it at an approved location, accepting no additional soil from the site, reimbursing DEM for testing, and providing a plan for increasing sampling frequency to every 2,000 cubic yards. The RI Dept. 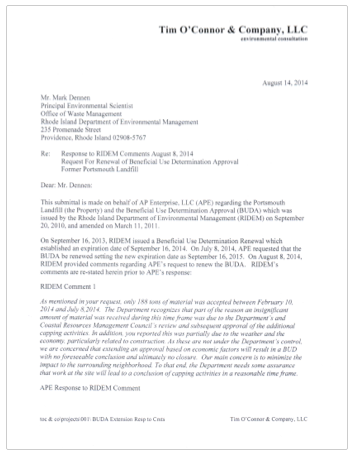 of Environmental Management has issued a response to a plea for more time from the company capping Portsmouth's former town dump, and while they have granted the request for a one-year extension, they stress that this is "final" and have required immediate action to complete the finished sections, according to documents released by DEM today. In the letter to Arthur Palmer Enterprise, DEM Principal Environmental Scientist Mark Dennen advises APE that although they are granting the extension to the governing agreement, the Beneficial Use Determination Approval, DEM "feels it is necessary to add two conditions." Second, DEM is requiring immediate work to bring the already completed sections of the site up to final condition with residential soil and grass cover. "Beginning on or before September 20, 2014 and ending November 30, 2014 APE shall cover and seed the eastern slope of the property that abuts residences in the area." This is a rebuke to APE, who had responded to DEM's prior request for immediate action with a proposal to begin the final cover work in six months. In addition to the response, DEM also distributed a letter written by the president of the Portsmouth Concerned Citizens, Larry Fitzmorris, and a letter and petition with 58 signatures from former Town Council president Joe Robicheau. Both complain of alleged health risks and other impacts on the neighborhood and urge the DEM to reject the extension. DEM responded with a by-now familiar correction of several misstatements which you can read here. 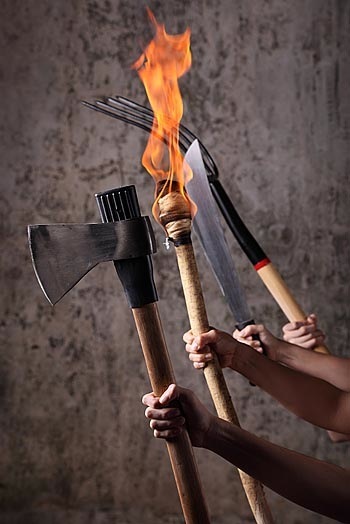 Editorial note: Sure seems like someone thinks they can wring another election cycle's worth of Island Park anger out of this issue. I, personally, remain unconvinced. But in the interests of full disclosure, long time readers may recall that Mr. Robicheau and I had a significant disagreement about the responsibilities of the Town in communicating with residents of our uniquely fragile neighborhood in the runup to superstorm Sandy. The RI Dept. 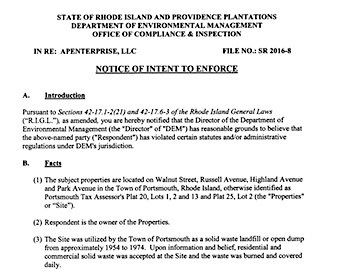 of Environmental Management (DEM) has issued new requirements for the company capping Portsmouth's former town dump, according to documents released by DEM this afternoon. 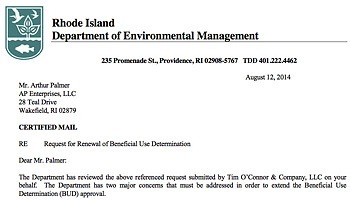 In a letter dated July 8, AP Enterprise, the firm engaged in the capping project, had requested RI DEM allow another one-year extension on the project back in July, citing delays in getting a CRMC approval and limited availability of suitable soil from construction projects. Similar arguments about the "weak economy" and lack of construction were featured in a similar request a year ago. As these are not under the Department’s control, we are concerned that extending an approval based on economic factors will result in a BUD with no foreseeable conclusion and ultimately no closure. Our main concern is to minimize the impact to the surrounding neighborhood. To that end, the Department needs some assurance that work at the site will lead to a conclusion of capping activities in a reasonable time frame. Additionally, DEM asks AP Enterprise to complete work on areas of the site which are already suitable for final covering operations. 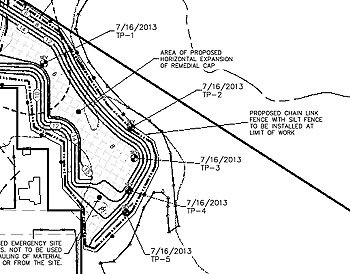 [L]ocations in the eastern portion of the site that abut residential properties could be brought to final grade and loamed and seeded at any time. The Department believes that final capping activities should proceed as quickly as possible. Read AP Enterprise's renewal request and DEM's response. The RI Dept. of Environmental Management has made several small tweaks to the Portsmouth landfill capping plan, according to an e-mail sent this morning to interested parties by DEM Environmental Scientist Mark Dennen. Documents in the e-mail cover adjustments to the border of the cap, reduction in the fenced area to accommodate wildlife on the salt marsh, and retaining vegetation barrier at the end nearest the Island Park playground. In an e-mail exchange with harddeadlines, Dennen explained the changes: "The important thing here is that you want to place your cap over the actual landfill, not over an approximation of the landfill boundary. Hence, the test pitting that was done." According to Dennen, these changes are still out for approval with the CRMC. Dennen also confirmed that despite the difference in end date for the Water Quality approval, the BUDA would still control: "Water Quality Cert, BUDA and CRMC approvals are all separate approvals. So they all have to be current to proceed." said Dennen.